If you are in search of the MMO gaming mouse, it is important to consider everything you are getting instead of just the comfort level. Just because an MMO mouse looks pretty does not mean it will be the right one for you. You will need to find the one that fits your hand, has the features you need, and is comfortable. 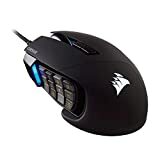 Choosing the best MMO mouse can help you succeed in your gaming ventures, whether you play WoW, Guild Wars 2 or any other MMORPG. Lightweight mice are generally considered better because they allow you to move quicker when needed, but opinions on this vary. Comfort is key, as most gamers spend a lot of time gaming and therefore need a mouse that feels nice in their hands. Another component that is very important is ease of use. Of course, it’s great if your hand feels comfortable on your MMO mouse, but if you aren’t able to access all of the buttons quickly, they aren’t going to serve as intended. Gaming mice have come a long way in the past decade, and gone are the days of having to use the keypad for most commands. Of course, the main thing you probably want in your MMO mouse is a lot of different buttons. Casual computer mice are very insufficient for the needs of a die-hard gamer. There are many different MMO mice offered today, and picking one can be very difficult and confusing, especially if it is the first time you are buying one. This article will serve as a guide for you to choose the best MMO gaming mouse. The sensor is a very important component of your MMO mouse. As we discussed in our previous article regarding the best FPS mouse, there is not much difference between “optical” and “laser” mice. Instead, the main difference is the kind of technology that the mice use for lighting. CMOS sensors in mice are typically optical and work by capturing images constantly and then comparing these images to conclude which ways and how far the mouse has moved. Dots-per-inch (“DPI”) is another critical characteristic of an MMO mouse. One of the biggest myths out there is that mice with higher DPIs are better than those with lower DPIs. Instead, however, the sensors inside many MMO mice actually aren’t designed for the higher DPIs. The fact of the matter is that you need to find the right DPI for you as well as whatever game you are playing. Many mice today come with extremely high DPIs, which is quite extreme seeing as most gamers do just fine with mid-range DPIs. When it comes to DPIs, another important factor is what surface you are using the mouse on and what kind of mouse pad you have. Both of these can certainly affect the performance of any mouse, so it may take a while for you to find the right DPI for you and your gaming setup. Another thing that will help you in choosing the best MMO mouse is determining your grip type. Over time, you will develop your own mouse grip style that works best for you, so it is important to consider this when buying an MMO mouse. Many people have a “palm grip,” meaning the whole palm grasps the mouse. Other people grip their mice like a claw, which is unique because the fingers tend to arch up. Another grip type could be classified as a fingertip grip, which is actually very hard to become a professional at because it means using the tips of your fingers to move the mouse at high sensitivities. Overall, you need to play around with your current mouse and determine your grip type before purchasing a new one. Similar to grip, the position of the buttons on your MMO mouse is crucial. Of course, you are going to have to know what you are pressing without even glancing at the mouse. Some people use their full thumb and press buttons hard, therefore needing bigger ones, whereas other people touch buttons with the tip of their thumb and fingers, so they can get away with smaller buttons. You may also want to determine if the tactile distinction in between the buttons is good for you. Some people can easily determine where one button ends and another begins; however, other people may not and need a mouse that helps them distinguish between buttons better. Some MMO mice can be quite expensive, but the purchase is worth it if it is going to last. Gamers are very hard on their mice and expect them to last a long time without decreasing in performance. That said, just because a mouse is heavier does not mean it is sturdier and will last longer. Before making a purchase, hold the MMO mouse and test it out if possible. It should go without saying, but a good MMO mouse shouldn’t be hard to program and handle. Both thorough and simple macros should be easy to create and use, so make sure you are buying one that has the macros abilities you need. As far as software goes, make sure the MMO mouse you are buying has all of the game profiles you are in need of. Mice that can switch profiles or characters with a simple press of a button are great, but not all of them have these capabilities. The configuration software should also be clean and simple to use. Even the best gamers can struggle setting up fancy new mice, so don’t be afraid to browse through the manual. Obviously, any time you make a new investment you think about pricing and what features you will get for the price. What is your budget, and what do you want out of the mouse? Do you want a wired mouse or a wireless mouse? How often do you game, and how long do you want this MMO mouse to last? When buying an MMO mouse, first determine your price point and the specific needs of yours. The Naga Chroma RGB MMO Gaming Mouse is made by the well-respected manufacturer Razer. Overall, this MMO mouse has 19 programmable buttons, which include 12 mechanical thumb buttons. Weighing in at about 135 grams, this MMO mouse is easy to move and has a tracking speed of 210 inches per second. The “tilt-click scroll wheel” is also a nice addition, as it goes in every direction to help you regardless if you are gaming or doing something else. The Naga Chroma prides itself on the claim that it has the “world’s most precise gaming mouse sensor”. The mouse is corded, which may or may not be a deal breaker for many people. Perhaps the coolest feature of the Naga Chroma is the color options. You can personalize your MMO mouse with different colors and it also allows for inter-device color synchronization. If you care about the appearance of your mouse, this is a great one. Corsair has continued to come out with decent products, and the Scimitar Pro is no different. The “key slider system” allows users to change the positions of the buttons and even lock them into place. The keycaps on the side buttons are also textured and can help improve grip and precision. There are 12 side buttons to the Scimitar Pro and they can be programmed with custom macros, timer countdowns, DPI matrices, etc. Users can also “tune” the mouse to their mouse pads, which includes the ability to change the settings down to just 1-DPI. The grip on the Scimitar Pro is comfortable, especially for those with a claw grip. This optical mouse features 16,000 DPI, which is also a nice feature, and you can also color code DPI of your different profiles. It can take a while to get used to this mouse, but it will be worth it in the end. Next up is the Logitech G903 Lightspeed MMO mouse. As if the sleek black design is not good enough, the Logitech G903 is very lightweight and easy to maneuver. This mouse has the ability to store five profiles, each of which can have their own customized macros. The 12,000 DPI sensor is more than enough for many people, so don’t let the lower DPI deter you. This MMO mouse has won several awards and is a prized possession of many gamers. The Powerplay charging mat that you can get additionally creates seamless wireless charging even while you are in the middle of a game. 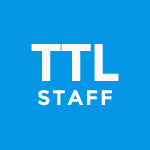 The software is easy to use and if you have a lot of Logitech devices, they are easy to switch. SteelSeries knew that a lot of gamers have issues with bottom key bindings, so they created a convenient “flickdown” switch that presses the two lower buttons to maintain smooth movements. Additionally, there is a lock feature if you are not using the bottom buttons, and without these buttons you can have a comfortable spot for your thumb when you are not gaming. This mouse is good for people with all different grip types but it seems to be harder to get used to than other mice. However, it is made to handle up to 30 million clicks, meaning it will last you a long time. Users report that this mouse feels more “natural,” as if it just moves with their hands. The 15-buttons are easy to reach and the optical sensor offers up to 16,000 DPI. Weighing 129 grams, it is relatively lightweight and it also has a smooth matte cover that gives it a sleek appearance. Coming in at around $80, the Logitech G600 is a great find. With a whopping 20 buttons, Logitech has provided a gaming mouse that allows you to customize your mouse even more than other models. The buttons take a bit of breaking in, but after a while of usage it will be just fine. The laser sensor can track as many as 8,200 DPI should you find yourself in need of that capability. One of the best features of the G600 is that you don’t need any software to access your MMO mouse’s setting information regarding tracking, button, and lighting if you are on a computer. Perhaps the best feature of this mouse is the “G-shift button,” which allows you to double the number of features that are customizable. Holding this button acts as a “shift” key like the shift key on your keyboard works and allows secondary functions. Also, the low-friction feet on the mouse work to make it run smoothly over any surface. Featuring 19 buttons, the Razer Naga Trinity offers upgraded rubber grips on the sides and the award-winning “mechanical mouse switches.” Weighing about 120 grams, this mouse is one of the lightest yet feature-packed mice you will find on the market. What makes the Razer Naga Trinity unique are the removable panels on it. It has a two-button layout, a circular hex layout, and a 12-button layout. Of course, the buttons are customizable and you can program them however you would like. The 5G optical sensor offers 16,000 DPI, ensuring your movements are swift and prompt. The $100 price tag can seem daunting at first, but after using the MMO gaming mouse and trying out the swappable panels, you may just feel like the purchase was worth it. ROCCAT is a company that is constantly keeping up with the changing technology. The ROCCAT Tyon features a Laser Sensor R3 with up to 8,200 DPI. This mouse is especially great if you have a ROCCAT keyboard because you can use the mouse to perform functions on the keyboard (and vice versa). Most notable about the Tyon are the buttons, which include a modifier button that works to double the button mapping. With a total of 16 buttons, this mouse has the ability to do 31 different functions. The dual-directional analog “thumb-paddle” allows users to change speed, zoom in and out, and more. The ROCCAT Tyon comes with a 5.9-foot braided USB cable for the connection and the mouse also features two little plastic feet on the bottom that make the mouse work on all types of surfaces. The storage has been upgraded to 576kB onboard memory and this MMO mouse boasts a 1-millisecond response time. Last, but certainly not least, the Redragon M901 deserves a shout out. Available in black/red and white/red, this MMO mouse looks pretty awesome. With a max DPI of 16,400, 18 programmable buttons, and 16 million LED color options, this mouse can easily be compared to many other mice but it comes at a fraction of the cost. The buttons on this mouse are placed conveniently, with 12 on the side and the remaining 6 across the body. If you prefer laser sensors, you’re in luck, as this mouse features an Avago laser one. The Redragon M901 also comes with an 8-part tuning set for the weight, should you need to change it. Though the software is nothing to rave about, it is easy to use and still gives you the needed options. With the low price and up-to-date features, this mouse would be good for anyone, especially gamers who are just getting started. 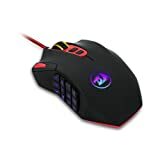 We have discussed the best MMO mouse options so that you can enhance your gaming skills and top the charts on whatever your favorite MMORPG is. Make sure to think about the factors that are important in choosing a mouse and, if possible, try a few out before making a purchase. Does one of them have left-handed designs? Not really. 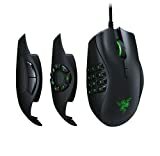 Razer Naga had a left-handed version but it’s currently unavailable on Amazon or official Razer website. Maybe you’ll be able to find it on eBay or craigslist. Logitech G903 LIGHTSPEED is ambidextrous so it may work (it’s expensive for just “trying” though so you may want to consider Razer Lancehead or some other similar ambidextrous alternative).